Bangladesh Islami Chhatrashibir has condemned and protested against the arrest of 5 leaders and activists by police in Chittagong from Bhujpur, followed by an arms extraction drama. 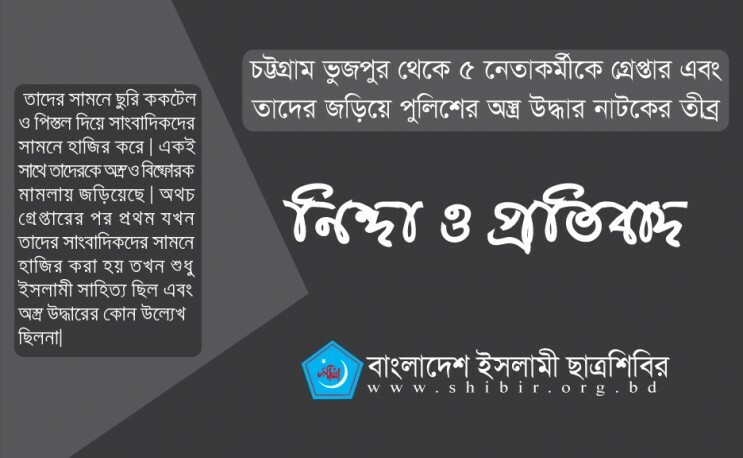 In a joint protest statement, Shibir President Yasin Arafat and secretary general Mobarak Hossain said that the police had not been able to refrain from their hateful behavior even before the Eid. Shibir leaders Alauddin, Abu Zafar, Abdul Mamun, Moinuddin and Abul Kashem were arrested from Bhujpur in Chittagong without any reason on 17th of August. After their arrest, the police made up the charge of possession of jihadi books to make up a reason for their arrest and to take them to the Bhujpur Police Station. But the next day, they were brought to the Chittagong Police Commissioner's office and presented in front of journalists with knives, cocktails and pistols. Police also showed them involved in arms and explosives case. But during the initial arrest and parade in front of the journalists, there was only Islamic literature and no mention of any arms recovery. There was also no mention in the press about arms extraction during the arrest. There is no doubt that the police planned to play an arms extraction drama. The police are mainly playing the role of the political worker. They are behaving like petty goons of the government. We do not have the language of condemning these irresponsible inhuman acts of police. In order to destroy the image of Chhatra Shibir and to destroy the future of meritorious students, the police have staged this arms extraction drama. Though the police may be directly involved with the ‘uncovering’ of these weapons, there is no connection whatsoever between these weapons and the Shibir activists. The people of the country are conscious of this being part of a deep conspiracy following the inhuman detention of innocent students. The leaders said, despite hundreds of condemnations, the police have been repeatedly doing such dirty work. In the past, police have arrested numerous Shibir activists and arranged arms and jihad books recovery dramas, which have all proved to be false in the passage of time, and the police have earned the wrath of the people for their lying. If the police had even a little respect for their profession, or commitment to the people and the country, they could not have done such irresponsible work. Thousands of student lives today face threats due to this inhumane irresponsibility by police, which is unacceptable. We want to say clearly, Chhatra Shibir is a ideologically committed organization. We believe in following the systematic and peaceful path. There is no distant relation between Shibir and such arms extraction dramas. Rather, the police repeatedly carried out such mal-intended drama to implement the government's agenda. The educational lives of many meritorious students are in ruins today due to such police activities. We demand an immediate closure of these illegal activities. The leaders urged the administration to abstain from such arrests and organized drama in the future and to free the arrested Shibir activists unconditionally and immediately.